Using a spherical design, the Janar cave bed cat house provides a cozy and private space for your fuzzy friend. And Janar sphere litter box is easy to clean with a unique filter. Need more features? Let’s keep checking. The Janar cave bed and sphere measure 19.7 x 19.7 x 18.1 inches. 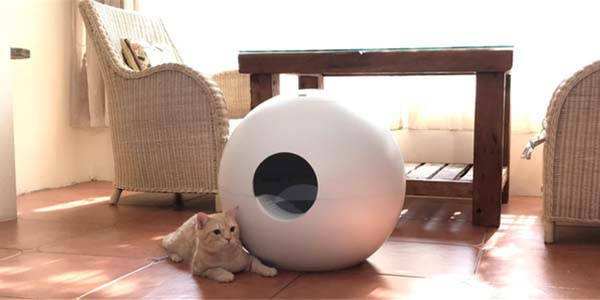 As we can see from the images, both models show off a minimalistic, spherical form factor, and with a clean and all-white design, the spherical cat house and litter box fit anywhere in your house. You can also paint different patterns on the exterior for a personalized look. Using the spacious inner pot measuring 18.9 inches diameter, the Janar cave bed ensures your cat can comfortably fall in sleep or have a rest. 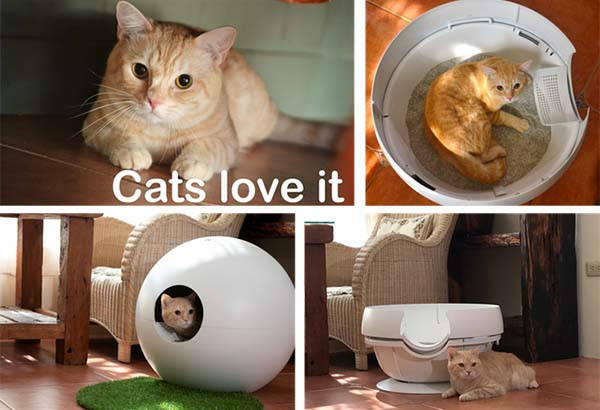 The Janar sphere litter box comes with two custom pots. The inner pot features integrated sieve, and the size of the sieve opening at the bottom is controlled with a switch so that you can easily sift through litter and pick out the clumps and waste. Meanwhile, by rotating the scraping rod along the inner pot wall in a circular motion, you can effortlessly remove clumps on the wall of the pot. The door sill plate avoids your pet carrying large amounts of litter out. Moreover, the top cover of your Janar is a spray box that can store 10.15 fl. oz. (300 c.c.) of germicide/deodorant solution. When your cat finishes the toilet, it automatically sprays the germicide/deodorant solution for 30 seconds on the surface of the cat litter. The integrated LCD display not only shows the number of times your cat enters/exits the litter box, but also lets you know when the battery is running low or there is no the germicide/deodorant solution in the spray box. The team behind Janar is raising fund for the product on Kickstarter. We can pledge $70/$69 to preorder the cat house or litter box. Both models will be shipped in October 2019.